The Air Queens are back! Mondovi's sky, Italian capital of the hot air balloon flight, is ready for the 28th Epiphany International Hot Air Balloon Rally taking place from January 8th to 10th. The Air Queens are back! 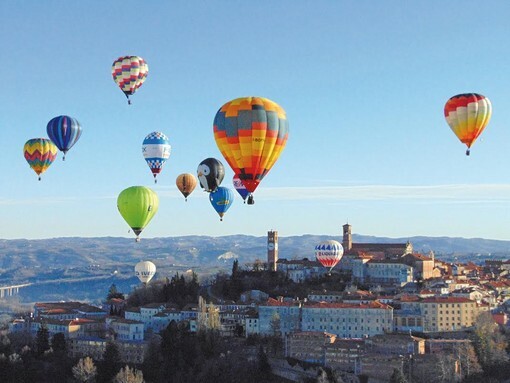 Mondovi's sky, Italian capital of the hot air balloon flight, is ready for the 28th Epiphany International Hot Air Balloon Rally taking place from January 8th to 10th. 25 hot air balloons and crews coming from all over Europe will be flying for two days. Races will take place on January 9th and 10th with two flights per day. Visitors will be allowed to the take-off area to admire these unique events. Many more special activities will entertain visitors to this extraordinary rally: the crews parade in the old town on January 8th, the Night Glow - evening ignition of the hot air balloons with music on Saturday, January 9th at 6.30pm and the kids flight, a completely safe take-off on Sunday, January 10th at 2pm. Donatella Ricci, pilot and vice president of the Women of the Air Association, is the race director. She recently broke the world record for the highest flight ever made with a gyroplane (microlight rotorcraft, halfway between airplane and helicopter ) reaching 27,556 feet (8,400 meters).